Much touted in advance, New York City Ballet’s just-premiered $800,000 Ocean’s Kingdom is a once-in-a-lifetime (please, god) collaboration by Paul McCartney (first a Beatle, now a knight) and Peter Martins (first a superb dancer, now a company director, a choreographer, and a Danish knight to boot). On the side of Good in the new ballet is an undersea population devoted to peace and love, featuring Princess Honorata (Sara Mearns). Representing the Bad–aggression, abduction, violence, and threatening hair-do’s–are the invading terrestrials, among whom the only nice guy is Prince Stone (Robert Fairchild). He falls in instant, Romeo & Juliet-style love with the Princess, and of course she, requiring a shade more persuasion, with him. But his nasty elder brother, King Terra (who plagued these characters with their names?) wants this trophy naiad for himself. 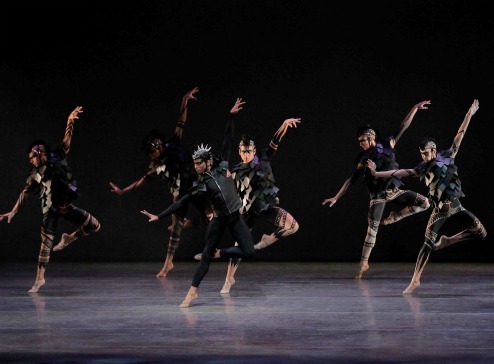 When the ballet winds down its 55-minute reign, it ends happily, without for one moment having earned the right to call itself a fairytale, its dramatic and emotional range being picayune. Real fairy tales–a powerful literary genre–take good and evil seriously and enact them with force. Observe any kid in their thrall. 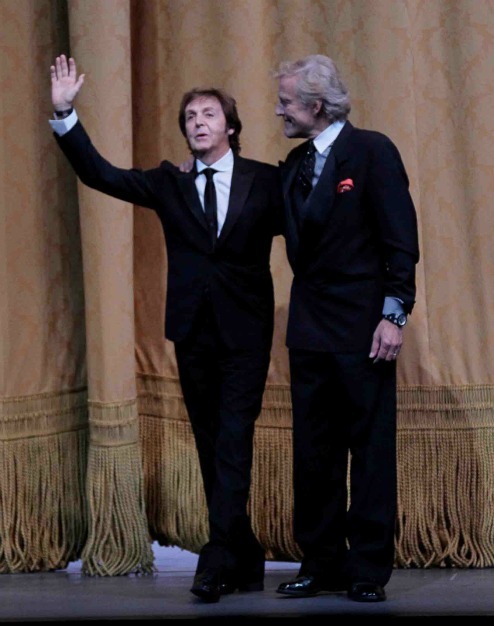 When it comes to classical-music credits on his résumé, McCartney’s been there and done that for nearly a decade. Nevertheless, his score for Ocean runs the gamut from movie music to faux-Broadway. The fashion designer Stella McCartney, daughter to Sir Paul, did the costumes, which range from limply imagined blue tunics for the ladies from the sea to gaudy tattooed cat suits for “The Baddies,” as the composer deftly nicknamed them. The scenery, for which the program blames Perry Silvey, is weightless, almost non-existent, consisting of unconvincing projections. Does the feeble decor reflect City Ballet’s making a last-ditch gesture toward keeping expenses down just in case the ballet fails to prove immortal? The pre-curtain efforts of the City Ballet’s chief music man Fayçal Karoui and his orchestra to make a case for the score were well brought off but unconvincing. The little teaching session served to fill in time because, I’m told, McCartney refused to have any other ballet share the gala opening-night program, (not even Balanchine’s Union Jack, which was originally scheduled). The choreography is instantly forgettable. Even the magnificent Sara Mearns offers merely a stymied sampling of the gifts that make her one of the most riveting dancers of our time. Instead of using her full-bodied emotional power, for example, she just acts with her face, now sweetly in love (Sara Mearns? Sweetly? ), now vapidly sorrowful. Her suitor, Robert Fairchild, looks benumbed by the choreographic vacuity and seems to be doing nothing beyond what he’s been told to do. This is hardly the dancer–ardent, witty, alive to every event–who last year originated the hero role in the City Ballet’s far-better venture into the waves, Alexei Ratmansky’s Namouna. The couple have the requisite love duets in which Mearns fleetingly recalled her fluent, sensuous, and imaginative self–and one duet that briefly suggests apache dance. Yet not a single phrase that Martins choreographed for the pair is likely to be remembered once the curtain falls. The only distinguished dancing in the show came from the veteran corps dancer Georgina Pazcoguin, in the role of Scala, a handmaiden of Honorata who, for reasons negligently kept secret, first betrays her mistress and the lady’s suitor, then saves their lives, sacrificing her own on their behalf. Pazcoguin stood out among the more than 45 dancers trapped in Ocean by following her usual method of building a full persona for her character. In her starkly cut black gown she looked like a Graham dancer from days of yore, the confidante who tries to warn the heroine that the situation is dire. Needless to say, this approach didn’t fit in stylistically with anything else going on, but, for me, it was the only meaningful action on stage. Pazcoguin should have been made a soloist long ago. For some reason, there’s a grand party–to pep things up with some acrobatic, exotic, and comic dancing, perhaps–but its raison d’être, plot-wise, is obscure. It features Daniel Ulbricht, the company’s expert in the acrobatic mode. He shines far more, however, when he’s used as a regular dancer, not a freak, or when the antics of a jester are part of the character he’s dancing. Would I recommend this product to a friend, as the Internet so often inquires? Rhetorical question. No need for a reply. I disliked “Ocean’s Kingdom” intensely. I thought the costumes ugly and distracting. I’ve never liked Peter Martins’s choreography. Martins was a great dancer but not a very good choreographer. I’ve never believed McCartney was a great musician and this just reinforced my belief. Paul McCartney, in his work with the Beatles, gave me a lot of pleasure. Peter Martins, during the evenings when he wasn’t on stage in the 1970s, but instead stood outside during intermission, looking beautiful, gave me a lot of pleasure. At present, however, the only knight worthy of the title in this group is you. Saw it today. It’s forgettable fluff. I decided to pass on the McCartney/Martins production, “Ocean’s Kingdom.” I don’t like classical music light and I don’t like Peter Martins’s choreography. I do like Stella McCartney’s clothes but I am sure the costumes alone were not worth the detour. However, Georgina Pazcoguin is indeed a fireball, a wonderful, intense dancer whose performances never fail to amaze me. I saw her dance Anita from “West Side Story” one evening and was blown away by the passion and energy of her performance. She made Anita come alive. In today’s mainly white and blond New York City Ballet she is totally under-appreciated. Once again, Tobi, thanks for pointing out what is really important in dance. I was there opening night and completely agree with all your comments. I was extremely disappointed. For years, I too have been saying why in hell is the brilliant Georgina Pazcoguin not getting promoted. It angers me and I just don’t understand Peter Martins. “Ocean’s Kingdom” sounds forgettable indeed, although there are some unforgettable lines in TT’s review. As for whether or not McCartney is a great musician, Ms. Silverberg’s Comment reminds me that I’ve been giving some thought to what happens when an artist, in this case a musician, stops making music and starts making Art. When McCartney–Sir Paul, if you will–was young and fooling around with his mates to make such marvelous songs as “Rocky Raccoon,” “Let It Be,” and “Martha My Dear” (yes, I take that one personally) he was in my view a great musician. The minute he became establishment, he got pompous and derivative. As for the ballet, if Sir Peter is so damned nostalgic for the undersea portion of “Napoli,” why doesn’t he program that? A friend wrote me that she hoped that “Ocean’s Kingdom” will attract young people to ballet. I was considering seeing “Ocean’s Kingdom” just to stay current, but you’ve dissuaded me. I’ll save my money for repertory performances.